Desperate to seem relevant again, the Fox host has been trying his best to manufacture news. Sean Hannity and Bob Woodward. Of all the right-wing media’s big guns, Sean Hannity has always seemed the most obtuse and, to me, the least watchable. With Rush Limbaugh you get to see an intelligent, even subtle, demagogic mind at work. Glenn Beck, in his day, was a marvel of wild whoopee, a rabid dog howling not only at the crescent moon over the Islamic Caliphate but at the Republican establishment. Bill O’Reilly is tough but agglomerated—watching him means catching occasional glints of independent thought, like on gun control or, tardy though it was, the Iraq War. In fact, Hannity is such a Republican shill that the night before the election, he declared that Romney would win, and take Florida, Virginia, Ohio and New Hampshire in the process. And what did he get for his troubles? Fleeing audiences. The February Nielsens show that in the 25- to 54-year-old “money demo,” Hannity’s ratings dropped a stunning 35 percent from 2012 (O’Reilly’s fell 26 percent). All cable news numbers tend to sink after the highs of an election, but MSNBC shows fell by smaller percentages, while some on CNN actually increased. Desperate to seem relevant again, Hannity has been trying his best recently to manufacture news. He had Representative Ellison, the only Muslim in the US House, on his show Tuesday, only to have him sit through a misleading, O Fortuna&ndash;themed montage of President Obama campaigning on the sequester, which led to a predictable blowout between the congressman and his smirking host. Ellison called Hannity "immoral" for his many lies and "the worst excuse for a journalist I've ever seen." It got Hannity's show on to the winger blogs, and the video went semi-viral. To keep those hits coming, ever since Hannity has been attacking Ellison's long-ago and since renounced "radical connections" to Louis Farrakhan, and asking, "Do we have somebody then in Congress that is the equivalent on one side what the Klan is?" But Hannity's big prize last night was Bob Woodward. The buckle-on-the-Beltway journalist wrote an op-ed for The Washington Post that claimed Obama's calling for added revenues to avoid the sequester was "moving the goal posts," an idea so politically dangerous, according to Woodward, that the White House threatened to get even with him for it. The Woodward thing was huge in the right-rage media for a few hours, so happy were they to get the former Nixon-slayer spouting their agitprop. Unfortunately for Hannity, however, the whole thing wound up reinforcing his current brand problem: his show is the best place to find faux outrage and fake arguments that make the base feel good, but turn out to be utterly misleading in the end. In a nutshell, Woodward took a mild e-mail by Obama economics adviser Gene Sperling (sent, it read, "as a friend") suggesting that Woodward would "regret" his sequester assertion, and hyped it into a threat to his person and the First Amendment itself. Once Politico had published the full e-mail, however, it became pretty clear that Woodward was either laughably thin-skinned or just another partisan GOP tool. Last night, Woodward made it all worse by first telling Sean, accurately, that he himself had never used the word "threat"—but within minutes, encouraged by Hannity's full-throated huff, he characterized Sperling's "regret" as a "coded 'you better watch out.'" Woodward knew that if you're having a problem getting a sketchy conservative political line over with the public, the Fox News show most likely to help you bootstrap it together with some sense of aplomb is Hannity's. 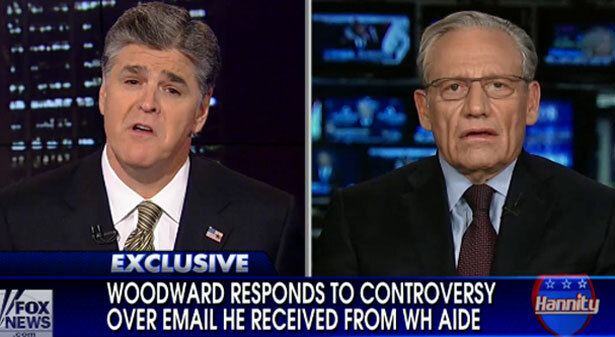 But by the time Hannity had the big fish on his show, many other conservatives were already worried that Woodward was a trap, or, at the least, a clever way to sell more establishmentarian books. "Looks like we were played," The Daily Caller's Matt Lewis wrote. Hannity's show is still number four among the cable news shows, and there's always the chance that his dramatic drop in ratings is temporary. But then again, maybe Hannity, who at heart is still a 1990s, padded-shoulders kind of conservative—a bully boy adapted for the early days of the financial boom—is just terribly out-dated. Lately his "Mission Accomplished" swagger seems less like a mark of certainty than a reminder that he's so often wrong. Even when he tries to reform, as he did days after the election by claiming he "evolved" on immigration and promised to quit describing undocumented immigrants as "illegal aliens," the temptation to backslide must be almost irresistible. It's hard for him. Hannity is the bubble inside the right-wing media bubble, the drill sergeant who keeps everyone in line. When he finally pops, you'll know the GOP is changing. Read Leslie Savan on the sequester and some conservatives&rsquo; change of heart.